No results. If you have any question about our service, please do not hesitate to contact us. What is Léon & George, and how does it work? Léon & George delivers healthy and beautiful indoor plants to your door—already potted, styled, and ready for their closeup. Every delivery also includes a 30-day guarantee and lifetime plant care support to keep your leafy friends happy and healthy. Customers can choose the size and variety of plant as well as specify the pot color and styling, or keep things simple and take a recommendation from one of our stylists. How does delivery work? What's included in my delivery? For large and extra large plants (available in the SF Bay Area and the Los Angeles area) we provide a white-glove delivery experience where you can select a delivery date and time that works for you at checkout. You'll get a reminder email the day before delivery with approximate timing. Our team will prepare and deliver your plant on the specified date, and also set it up for you in your space if desired. Pricing for these locally-delivered orders is determined based on your location and how long it takes our driver to get there from our greenhouse. You can order as many plants in one order for the same flat delivery fee. 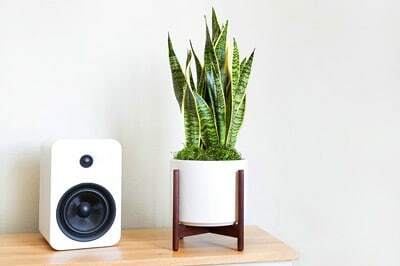 For small and medium plants (available nationwide), we ship via UPS, packed carefully using secure, cushioned boxes that keep your jet-setting greenery looking fresh. When your plant arrives, just remove the protective packaging and enjoy your beautiful new greenery! Orders depart within 2 days and the average shipping time is 1 to 3 days. Orders over $100 ship for free, otherwise there's a $10 shipping cost. All plants come pre-potted and styled in their decorative ceramic planters, along with simple care cards to help you get started with your new leafy roommate! What is your 30-day guarantee all about? We want to assure you that anyone can be a successful plant owner. Our plants are all easy to care for and come with foolproof care instructions. It takes a little practice to develop a green thumb, but if the plant dies within your first 30 days, we'll replace it free of charge! Read through our return policy for more information. How are your plants different from the ones at local nurseries, or big-box retailers? Léon & George is not your typical plant shop. We make it possible for you to get the interior design look you've seen in your favorite magazines and design blogs, without the hassle of buying and matching separate greenery, planters, and stands. We do this by pairing each plant with a custom planter designed to fit your space and meet your plant's needs for healthy growth. What if I have a question about my plant or my order? Just send us an email at hello@leonandgeorge.com and we'd be happy to help. How do I pick the right indoor plant for me? We choose to sell plants that are particularly easy to care for, so take note of the light and water conditions described on each plant's page and see if it matches the conditions you can provide it. Often our plants are tolerant of a wide range of conditions and you can just pick a plant based on aesthetics alone. How will I know how to take care of my plant? What if something goes wrong with the plant? Plants experience ups and downs (just like us!) and most problems can be fixed if detected in time. Make sure your plant is getting the amount of light and water as described on your care card, and that it has not been subjected to extreme temperature conditions or regular drafts of wind. If you need help diagnosing the issue, send us an email at plantdoctor@leonandgeorge.com and we'll help! Are your plants safe for pets and children? What if I travel somewhere – will my indoor plants die? Not necessarily, especially if you plan ahead a bit. If you're going away for a week or less, there should be no problem if you soak the soil in advance. And if you're going away for longer check out our blog post or send us an email at hello@leonandgeorge.com and we'll give you instructions for prepping your plant for the long haul. How do I choose the right plant for my space? Just like people, every plant has a unique personality. They'll look and feel different in your space, and they might take a few days or weeks to get used to being in their new homes. But we've curated our collection to feature easy-care greenery that's well adapted for city environments. You can start by shopping our best sellers, or browse plants by size, light levels, and more. The care guide on every product page will have more details about what will make each plant happiest. All our greenery is designed to be resilient and tolerate a range of conditions, so we recommend following your heart (and/or your interior design vision board). We're also here to help! So if you're not sure where to start, you can contact us at hello@leonandgeorge.com (or pay us a visit if you're in the SF Bay Area), and we'll help you find your perfect match. Why didn't I receive my order confirmation email? Don't panic! Your order is probably in the works and will be confirmed shortly. Double check your spam folder. If you have any questions or concerns about your selections, you can always contact us at hello@leonandgeorge.com and we can resend your confirmation email. In the meantime, check out these delightful plant puns from our friends at Thought Catalogue. Can I send a plant as a gift? How does that work? We're a little biased, but we think plants make the perfect gift. Start by selecting the delivery location at the top of any Léon & George webpage. That way, you'll see exactly which plants are available. After you pick out a plant, simply fill in the recipient's address for shipping. You can even add a personal note for them at checkout, and we'll include it with their delivery. Order departs via UPS within 2 days. What's included with the plant when it's delivered as a gift? Every gift order includes the plant and pot set, simple care instructions to keep the plant happy and healthy, and interior design tips to make sure they also look great in their new home. Gift orders are also covered under our 30-day guarantee and our Plant Doctor program, which means the recipient can call us anytime for plant care support. Being a new plant parent can have its ups and downs, but we make sure our plants are simple to care for and easy to love! Do you include the price tag when you deliver a plant as a gift? No. We process everything ahead of time through our secure billing platform. The email address associated with the order will receive a payment confirmation email once the order is processed. The lucky recipient will not see any pricing or billing information. Your plants look so perfect in the pictures… Are they real?! Yes! Our plants are 100% real, which means that they'll need a little TLC to keep growing. But thanks to our plant care and design team, they'll be styled, nurtured, and primed for life indoors before they arrive at your door. And we promise, if you're kind to your plants, they'll return the favor! Learn about the health benefits of spending time around plants. Where do you deliver? What if my city is not listed? We deliver to cities nationwide! Select your delivery city at the top of any Léon & George webpage to see what's available in your area. Our California-based team is working hard to perfect our shipping process for medium and large floor plants, but for now, larger plants are only available for delivery to cities in the Bay Area and Los Angeles Area. What times do you deliver? What if I need a delivery outside of these times? Deliveries by mail will arrive via UPS Ground within 4-7 days of your order. To avoid having plants cooped up in their boxes for too long, we recommend being available on the day the shipment arrives. You'll receive an alert when your package is shipped, with a link to track the package. What if my pot and plant look different than on the website? No two plants are exactly alike. Although we make the best attempt to get you a plant that's as close to the pictures as possible, there will always be variations—that's what makes the plant uniquely yours! Note that the plant heights displayed on our website are measured from the floor to the top of the leaf. Similarly, our ceramic pots are handcrafted, so consider any tiny differences or imperfections part of their unique charm. We will always make every effort to get you the exactly the product you see on our website. That said, if you're not over the moon about your new greenery, you can send it back to us. You bet! You can pick one up in person, or use this handy form to generate and e-gift card for your plant-loving friends.